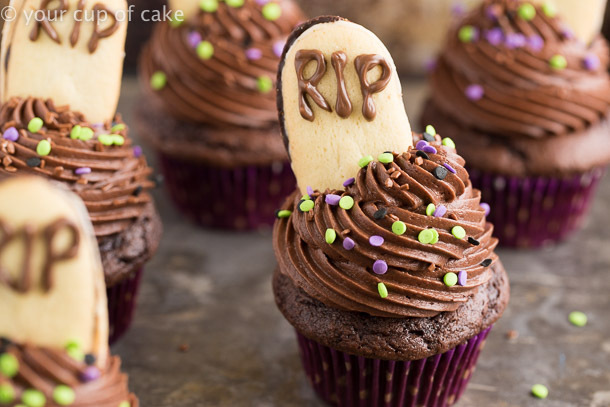 These Graveyard Cupcakes are topped with Tombstones made of Milano cookies! 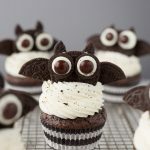 They’re the easy treat for Halloween you’ve been looking for. 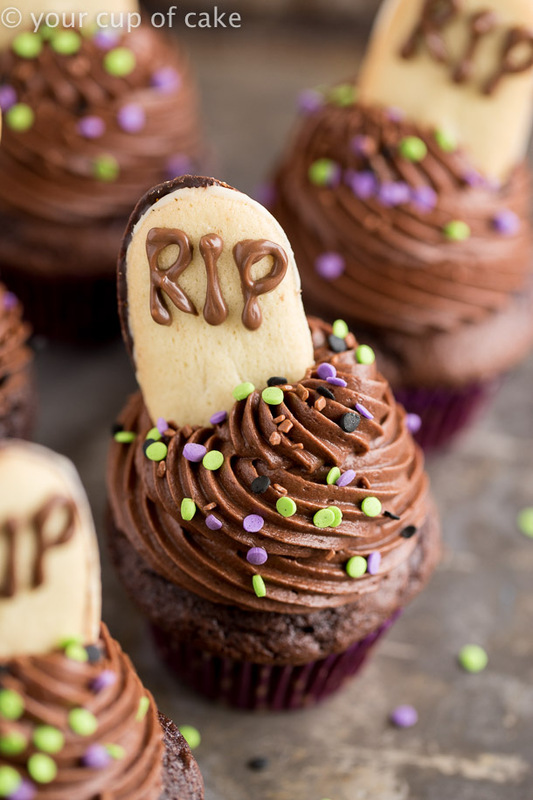 Sometimes all it takes is a simple touch to take regular chocolate cupcakes to spooky Graveyard Cupcakes. 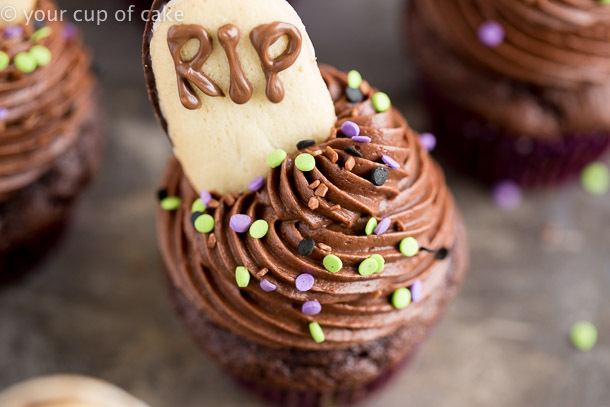 I used Milano cookies to make my tombstones but you can use different cookies! 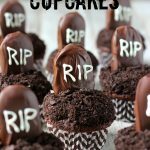 Then I made a mini piping bag out of a ziplock lunch bag and snipped off the corner to pipe out the melted chocolate spelling out RIP. 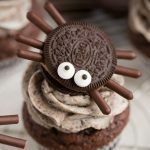 I added a pop of color with some halloween sprinkles from the grocery store and tah-dah! 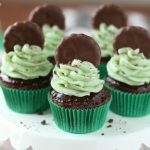 Most people have a favorite recipe for cupcakes, use whatever recipe you love and top it with frosting and these cute cookies! 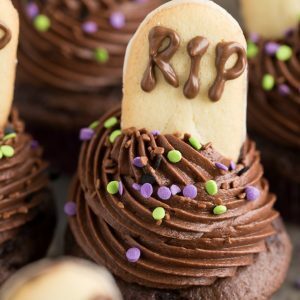 Halloween doesn’t have to mean spending hours slaving away in the kitchen to make an adorable treat, sometimes the best treats are simple (like my Graveyard Muddy Buddies)! The hardest parking about making these for me was piping out RIP. I have horrible handwriting. 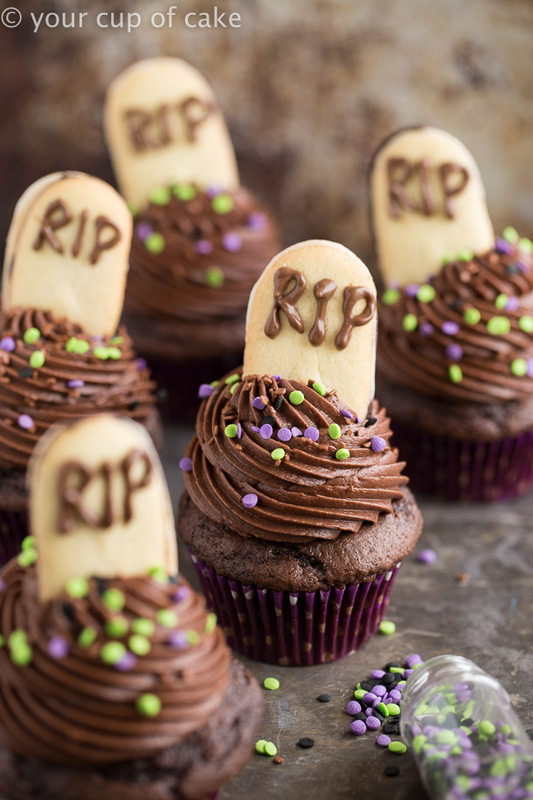 But all the cookies looking different just adds to the spook effect and personality. Oh! 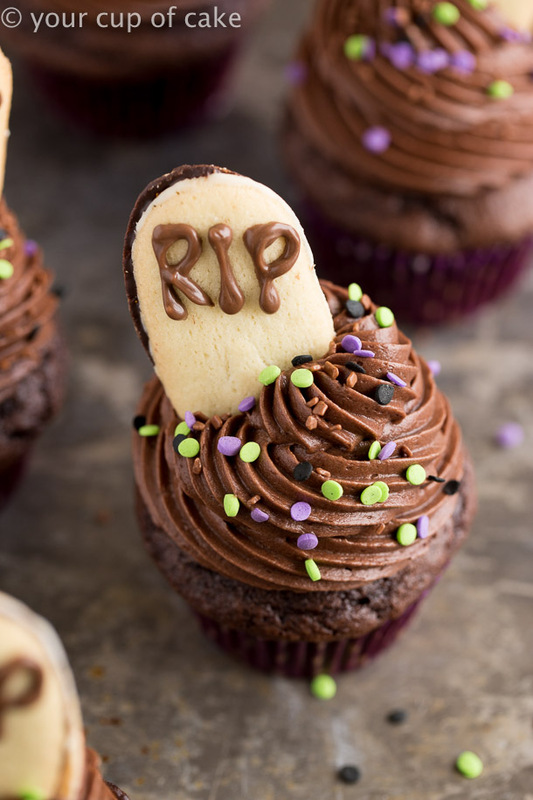 And if cupcakes aren’t your thing, you can make a cake and stick the cookies in to make an entire graveyard! People are always asking my about my must-have cupcake tools, so here are the two I’m obsessed with! 24-Well Baking Pan: This is awesome because some ovens don’t fit 2 pans with 12 cupcakes in each, but this pan always fits! I LOVE it! It’s also just a tad shorter than most pans so I don’t get they dark rim around my yellow/white cupcakes. 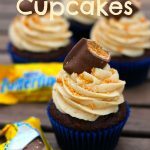 Food Scoops: The yellow one is my favorite for cupcakes! The black and purple are great for small cookies! 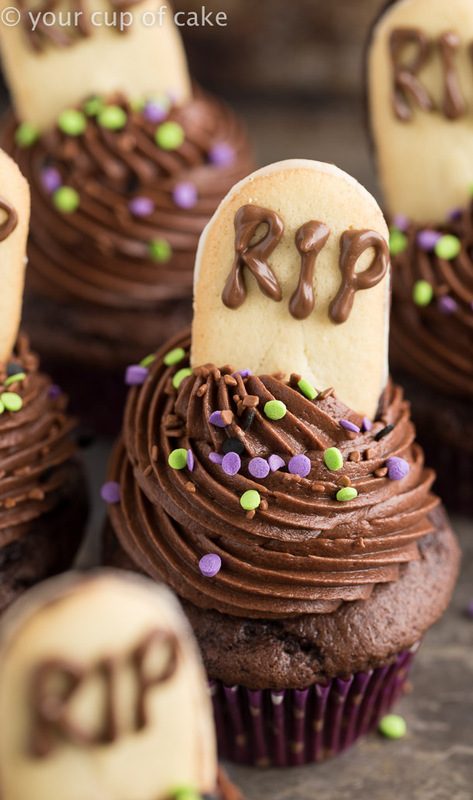 Never underestimate the power of some sprinkles, they really brought these cupcakes to life… well as much life as possible into some graveyard cupcakes haha! 5. 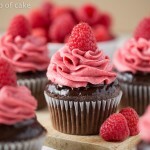 Fill cupcake liners 1/2 full and bake for 18-22 minutes or until an inserted knife comes out clean. Let cool. 6. Frosting: Beat butter until smooth. Add vanilla extract, cocoa powder and milk. 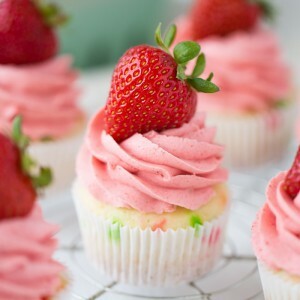 Slowly add in powdered sugar until you reach your desired consistency. 7. 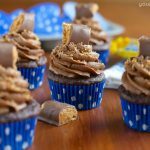 Make a mini piping bag out of a ziplock bag, snip off the corner and use it to pipe on the melted chocolate onto the cookies. 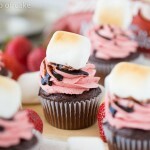 Let set and then frost cupcakes and top with cookie and sprinkles. These are adorable and such a simple idea. Two things I love in a dessert. How much buttermilk? 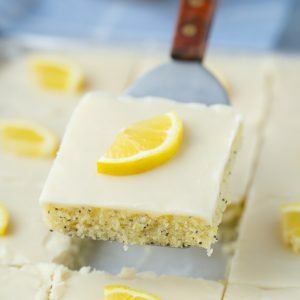 In the process of making and it’s in the directions but not in the list of ingredients. I am so sorry! I fixed both of those! I must have just not finished the list, so sorry! I hope you had a Happy Halloween Jenny!